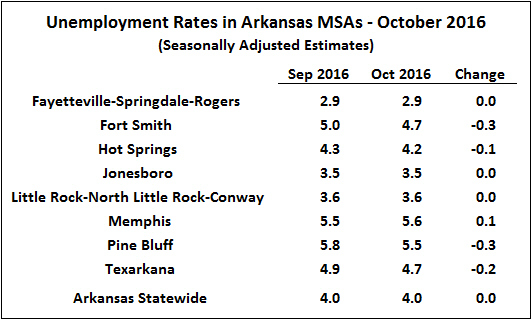 Differences in unemployment rates among Arkansas’ metropolitan areas generally narrowed slightly in October. In the areas with the unemployment rates below the statewide average of 4.0% (Fayetteville, Jonesboro, and Little Rock), rates were unchanged. 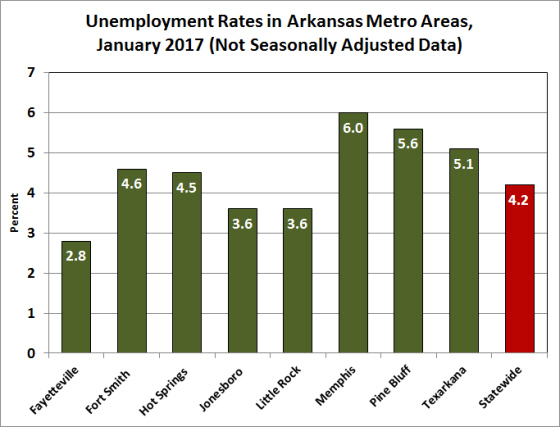 Unemployment rates were down 0.3 percentage points in Pine Bluff and Fort Smith, and down 0.2 percentage points in Texarkana. 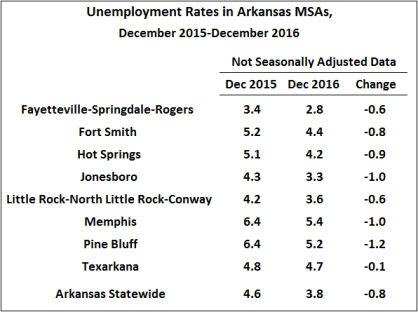 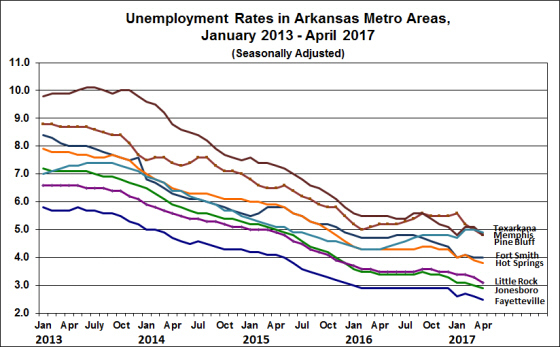 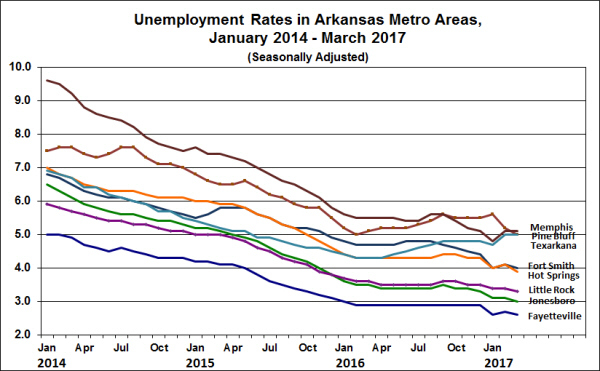 In Hot Springs, where the unemployment rate remains slightly above the statewide average, the unemployment rate ticked down by 0.1. 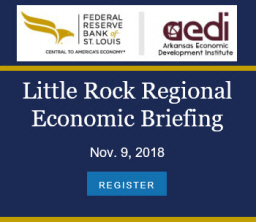 Memphis was the exception to the pattern, where a 0.1 percentage point increase in unemployment increased the rate to the highest among all metro areas that include parts of Arkansas. 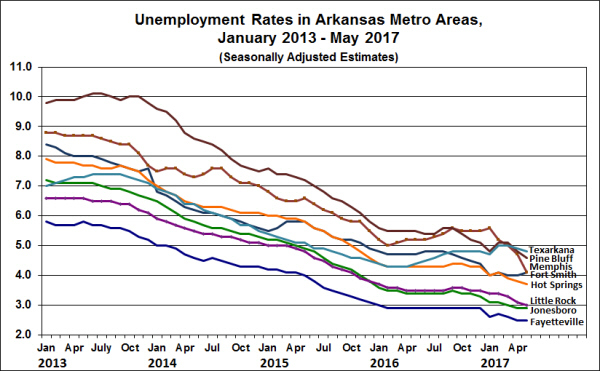 Unemployment rates remained lower than a year earlier in all eight of the metro areas. 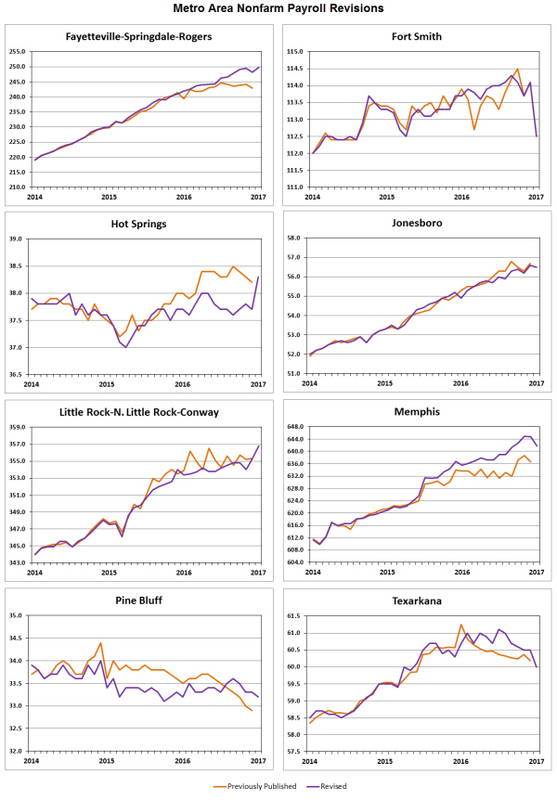 The largest decline was in Pine Bluff — down 1.6 percentage points (not seasonally adjusted data). 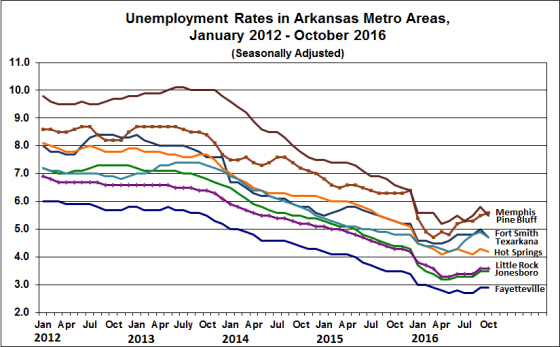 The unemployment rate in Texarkana rose 0.5 percentage points since May, but was 0.1 percentage point lower than in October 2015. 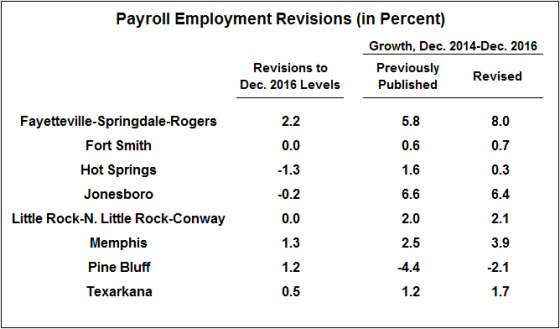 Data on nonfarm payroll employment was mixed. Employment was higher in Memphis, Fort Smith and Little Rock, but declined in Jonesboro, Hot Springs and Pine Bluff. 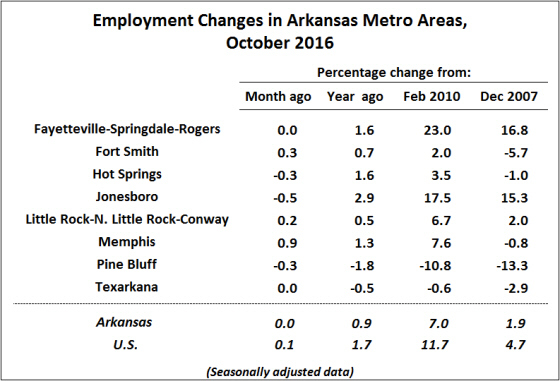 There was no change in Fayetteville and Texarkana. 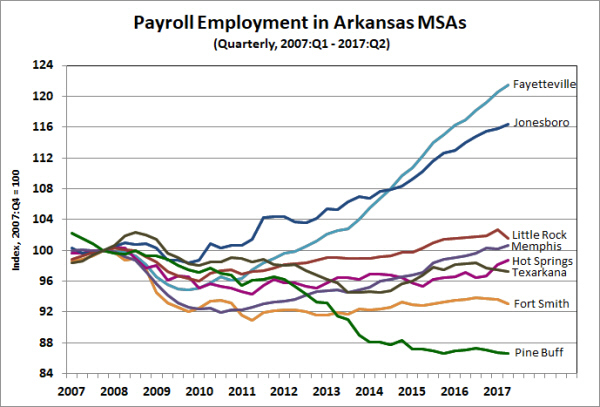 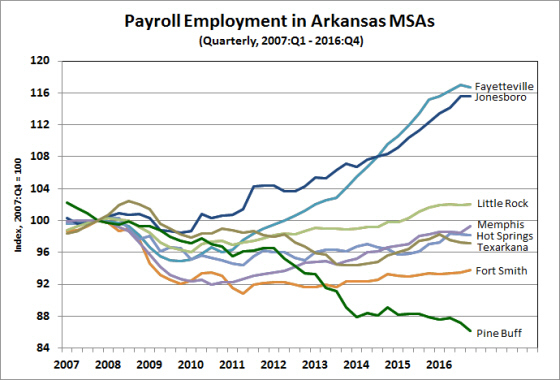 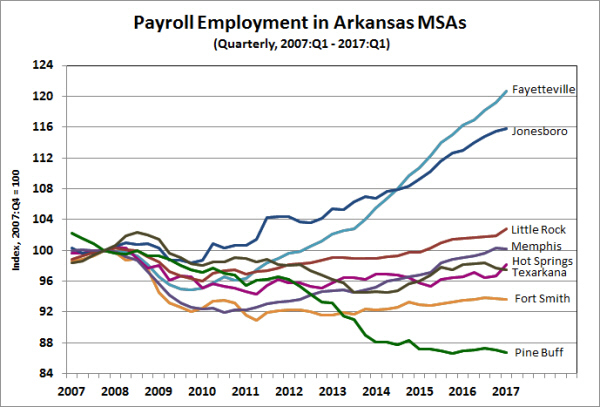 Over the most recent 12 months, employment has increase in all metro areas except Pine Bluff and Texarkana. Those are also the only two metro areas where employment has declined, on net, since the nationwide and statewide employment trough-date of February 2010.